Spread the Love Campaign coordinated by Mavuno Church seeks to harness people and resources to restore dignity and hope to children in public primary schools and those serving term in correctional institutions such as prisons. With a goal of raising 1 Million hours annually of community service through volunteers. The 2018 focus is on rehabilitating of 5 public schools namely Rabai Road Primary School, Plainview Primary School, Lavington Primary School, Mlolongo Primary School and State House Road Primary School with an aim of restoring dignity and hope back into our public schools. Public schools in Kenya experienced an increase in enrolment following the 2003 re-introduction of free primary education which was aimed at providing more opportunities for out of school children. Within one year of implementation UNESCO, 2005 reported an increase in gross enrolment rate (GER) which resulted in more than 1.5 million out of school children joining primary schools. However, school facilities and infrastructure proved to be a challenge as classes became congested with limited physical facilities, sanitary and hygienic toilet facilities. The Spread the Love campaign saw an opportunity to adopt five public schools and mobilize resources to uplift the standards of the infrastructure. According to Pastor Milton Jumba, Executive Pastor at Mavuno Church in Charge of City Impact, 2018 Spread the Love campaign will be repainting classrooms and rebuilding kitchens and toilet blocks in five public schools in Nairobi based on the needs assessment in each school. “This is in accordance with the third stanza of the national anthem. “Let all with one accord, in common bond united, Build this our nation together”, says Pastor Milton. The culmination of activities will be happening on 18th August 2018 when volunteers will be at the respective schools participating in work hours. With a target of raising 4.8 million toward this year’s renovation requirements, the Spread the Love campaign is raising both human resource (to paint, plant trees and landscape) and raising finances that would allow purchase of materials required at the specific schools (paint, paint brushes, rollers, sandpaper, drinking water, trees, manure etc) to get the work done. At Rabai Road primary school in Eastlands Nairobi, only 2 classes are connected to electric power supply. The classroom had potholed floors, with damaged noticeboards and missing doors and windows. Spread the Love campaign painted the outer walls of the whole school including the administrative block, transforming the physical appearance of the school. Mlolongo Primary school 1350 students share eight toilets, two of which are mabati pit latrines with no doors. Due to inadequate furniture a number of students stand or sit on the classroom floors and use stories and planks as desks during lessons, says Jacqueline Mathaga, chairperson of the Spread the Love Strategy Team. Lavington Primary has to date managed to repaint classrooms, landscape the grounds and is currently renovating the ablution block, says Mr. Alex Nyaga, Chairperson of Spread the Love at Mavuno Crossroads. At State House Road Primary School, the campaign renovated the school hall and installed the water tank for their toilets. More resources are needed to upgrade the ablution facilities as well as the staff room, says Pastor Emmanuel Kariuki whose church campus has adopted the school. 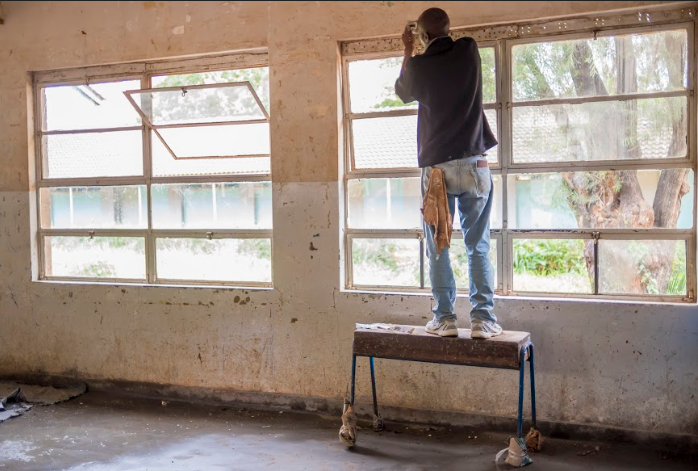 Meanwhile, Plainview Primary school needs repainting, windows are broken and the ceilings are giving way due to roof leaks, says Pastor Vincent Ayino. Thanking the Spread the Love campaign for the renovations, Lavington Primary School, Margaret Kilonzo, DeputyHeadteacherr at Lavington Primary School, said the renovations of the schools had increased moral of teachers and students and cited increased enrollments and improved attendance by students which has influenced improved academic performance. Students have also been trained on good stewardship to maintain a clean school environment.